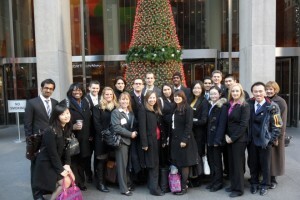 For many Simon Marketing Association (SMA) members, winter vacation kicked-off with the annual New Jersey/NYC Trip. About twenty MBA and MS students spent three days visiting companies in the tri-state area to learn about different marketing roles. This year, we visited Unilever, Novartis, The New York Times, Fox Business Network, Reckitt Benckiser, and Undertone. The variety of companies and industries ensured that every SMA member was able to learn about a role or industry they’re interested in, from CPG & OTC brand management to media ad sales. We participated in honest discussions with high-level decision makers at each company. I was surprised by the amount of access we were allowed. In my opinion, this access is one of the many benefits of going to business school; professionals are willing to speak to students openly about their roles. After our tour of NYC-based companies, we joined forces with the Financial Management Association (FMA) and numerous Simon alumni for a midtown happy hour. There was a great turnout (which is typical for events that provide free drinks and apps). The NJ/NYC trip exceeded my expectations of what a student club can offer. Full disclosure: when winter break began, the first thing I wanted to do was throw on sweatpants and catch-up on neglected television shows. Delaying my state of vegetation to visit companies with the SMA proved invaluable. I was able to experience a world of different careers while bonding with classmates during early-morning van excursions.